Worldwide, lung cancer is the most lethal malignancy, one responsible for more than 1.3 million deaths annually. The deaths are most-often associated with rapid spread (metastasis) of the lung cancer to multiple other body organs. Here, I review recent research on cancer stem cells in lung cancers, including important research unveiled only this week. 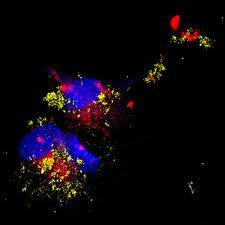 The research offers a possible approach for prevention or cure of metastasis in lung cancers. I have written several times before about CSCs (cancer stem cells). For example, their role in prostate cancer is discussed in the recent blog entry Prostate cancer – epigenetic factors, the role of Nrf2, cancer stem cells and actions of phytochemicals. See also (ref) and (ref). The most-salient considerations are a) CSCs constitute a small subpopulation of the cells in a tumor, ones with stem-cell-like properties and are capable of differentiating into active cancer cells, b) therapies that kill regular cancer cells but not CSCs may temporarily seem to clear up a cancer but relapse is highly likely as the cancer stem cells differentiate to make new cancer cells, c) CSCs are hard to kill, and d) cancer stem cells seem to play a key role in rapid metastasis of particularly malignant cancers. Epithelial-mesenchymal transition is an important step in creating squamous lung cancer stem cells and is driven by elevated β-catenin signaling. Several phyto-substances including epigallocatechin-3- gallate, curcumin, isoflavones, indole-3-carbinol, resveratrol, and isothiocyanate can limit epithelial-mesenchymal transition in cancers via modulating microRNAsin cancer cells. MicroRNA precursor let-7 and microRNA miR-31 interact so as to determine whether lung cancer stem cells are quiescent or differentiating. The March 2012 publication Reduced miR-31 and let-7 maintain the balance between differentiation publication Reduced and quiescence in lung cancer stem-like side population cellsreports: “Recent studies have indicated that side population (SP) cells, which are an enriched source of cancer stem cells (CSCs), drive and maintain many types of human malignancies. SP cells have distinguishing biological characteristics and are thought to contribute to metastasis, therapy resistance, and tumor recurrence. In the present study, the miRNA expression profiles of SP cells and non-SP cells were compared using miRNA array analysis. Both let-7 and miR-31 were significantly down-regulated in SP cells compared to non-SP cells. The results were confirmed by real-time PCR. Engineered repression of miR-31 caused marked repression of both lung cancer SP cell and non-SP cell growth in vitro. In contrast, engineered repression of let-7 caused marked promotion of both lung cancer SP and non-SP cells growth in vitro. Cell cycle studies further revealed that reduced miR-31 could inhibit SP cell proliferation by a cell cycle arrest in the G0/G1 phase, whereas reduced let-7 induced SP cell proliferation by accelerating G1/S phase transition. Notably, reduced miR-31 prevented SP cell differentiation, whereas reduced let-7 promoted SP cell differentiation under differentiation conditions. These findings indicate that reduced miR-31 and let-7 are involved in maintaining the balance between differentiation and quiescence in SP cells.” The suggestion is that microRNA-based therapy might be used to stem the differentiation and proliferation of lung cancer stem cells. Conventional treatment of in non-small cell lung cancer (NSCLC) can actually foster creation of cancer stem cells. In non-small-cell lung cancer, resistance of cancer stem cells to chemotherapy results from operation of the DNA repair machinery involving the DNA damage checkpoint protein kinase Chk1. Inhibiting Chk1 during chemotherapy can reduce survival of the cancer stem cells. One approach to targeting CSCs in lung cancer in is to target the expression of telomerase in those cells. A key gene has just been discovered related to lung cancer stem cells that plays a critical role in tumor proliferation and metastasis. MMP-9 also plays a role in the invasiveness of adenocarcinomalung cancer, and invasiveness can be inhibited via inhibition of NF-kappaB using osthole. The April 2012 publication Osthole inhibits the invasive ability of human lung adenocarcinoma cells via suppression of NF-κB-mediated matrix metalloproteinase-9 expressionreports: “The induction of matrix metalloproteinase (MMP)-9 is particularly important for the invasiveness of various cancer cells. Osthole, a natural coumarin derivative extracted from traditional Chinese medicines, is known to inhibit the proliferation of a variety of tumor cells, but the effect of osthole on the invasiveness of tumor cells is largely unknown. This study determines whether and by what mechanism osthole inhibits invasion in CL1-5 human lung adenocarcinoma cells. Herein, we found that osthole effectively inhibited the migratory and invasive abilities of CL1-5 cells. A zymographic assay showed that osthole inhibited the proteolytic activity of MMP-9 in CL1-5 cells. Inhibition of migration, invasion, and MMP2 and/or MMP-9 proteolytic activities was also observed in other lung adenocarcinoma cell lines (H1299 and A549). We further found that osthole inhibited MMP-9 expression at the messenger RNA and protein levels. Moreover, a chromatin immunoprecipitation assay showed that osthole inhibited the transcriptional activity of MMP-9 by suppressing the DNA binding activity of nuclear factor (NF)-κB in the MMP-9 promoter. Using reporter assays with point-mutated promoter constructs further confirmed that the inhibitory effect of osthole requires an NF-κB binding site on the MMP-9 promoter. Western blot and immunofluorescence assays demonstrated that osthole inhibited NF-κB activity by inhibiting IκB-α degradation and NF-κB p65 nuclear translocation. In conclusion, we demonstrated that osthole inhibits NF-κB-mediated MMP-9 expression, resulting in suppression of lung cancer cell invasion and migration, and osthole might be a potential agent for preventing the invasion and metastasis of lung cancer.” The publication itself does not mention the role of cancer stem cells in the process but I speculate that they are involved since the MMP-9 is known to be associated with invasiveness in a number of cancer types. In gastric and breast cancers, the compound diallyl disulfide contained in garlic is also known to control MMP-9 and cancer cell invasiveness(ref),(ref),(ref), and it appears that another garlic component S-allylcysteine can control invasiveness of non-small cell lung carcinoma. According to the 2010 publication Consumption of S-Allylcysteine Inhibits the Growth of Human Non-Small-Cell Lung Carcinoma in a Mouse Xenograft Model, “–this study investigated whether consumption of SAC (S-allylcysteine) could prevent the growth of NSCLC in both in vitro and in vivo models. It was found that SAC significantly inhibited the proliferation of human NSCLC A-549 cells in vitro. Treatment of the NF-κB inhibitor, Bay-11-7082, could significantly inhibit the proliferation of NSCLC A-549 cells. The results demonstrated that SAC significantly suppressed the activation of mTOR, NF-κB, and cyclin D1 molecules in vitro. Furthermore, the results demonstrated that consumption of SAC significantly inhibited the growth of highly metastatic human NSCLC cells in tumor-bearing mice. 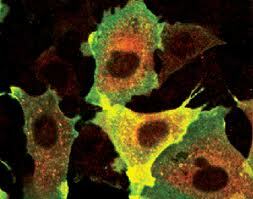 Bioluminescence imaging and pathological and immunohistochemical (IHC) staining results also indicated that SAC could effectively suppress the growth and malignant progression of human NSCLC in vivo. The chemopreventive effects of SAC were associated with suppression of mTOR and NF-κB molecules in vivo” Again, the publication does not mention the involvement of cancer stem cells or metalloproteinases, though I speculate that they are involved. I found an incredible number of publications on the anti-cancer and anti-invasive properties of curcumin and several other publications that link cancer stem cells to invasiveness, and others that link either curcumin or cancer cell invasiveness to metaloproteins. But I could find none none that directly links curcumin to its actions on cancer stem cells. Again, many if the dots are not connected, probably because the research on cancer stem cells is so new. The world of lung cancer research is vast, and I have touched only on a tiny but possibly very important segment of it here. Clinicaltrials.gov lists 3967 studies for lung cancer, and 2967 studies related to cancer stem cells. 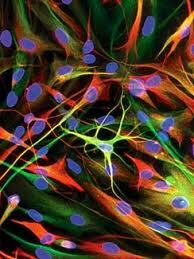 217 studies are reported related to lung cancer stem cells. So you can see how important the topic is, how highly selective I have had to be here, and how rapidly therapeutic applications related to lung cancer stem cells may be approaching the clinic. Diagnosis of metastasizing lung cancer does not have to be the sure death sentence it is now and perhaps in a few years it won’t be.